Direct Oceanfront. 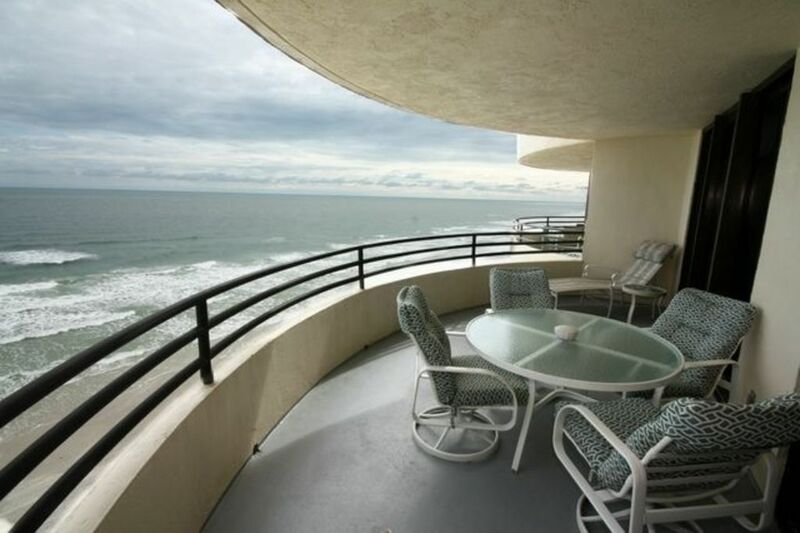 Le plus grand balcon de Daytona Beach !! Luxueux, Totalement rénové, privé, bord de l'océan, non-fumeur, 2 chambres, 2 salles de bains appartement est situé au 7ème étage de l'Sand Dollar Condominium à 3115 S. Atlantic Ave. Tant le salon et la chambre principale ont accès à un grand balcon privé supplémentaire offrant une vue spectaculaire, dégagée, 180 degrés de l'océan Atlantique du nord au sud aussi loin que l'œil peut voir! Juste rénové et propre comme ils viennent. Internet gratuit, HDTV / DVD dans chaque chambre et le salon. LOCATION A LA SEMAINE: Période minimale de location est de 7 jours. NOUS ACCEPTONS MASTER CARD, VISA et DISCOVER. S'IL VOUS PLAÎT VÉRIFIEZ CALENDRIER DE DISPONIBILITE AVANT E-ENVOI POUR UN DEVIS DE PRIX. CONSTRUCTION: Système de sécurité, alarme central / Détecteurs de fumée / Système d'extinction automatique, 2 High Speed ​​Ascenseurs, bain à remous, 2 saunas, chauffée bord de l'océan Piscine / spa, salle d'exercice, garage souterrain avec 7'door. Même si nous utilisons un service de nettoyage, au moins une fois par mois, nous nettoyer personnellement l'sur la façon dont les coins et les endroits qui sont négligés par le service. Ce le plus propre et mieux nommé, vous trouverez dans la région. Excellent views and the beach was very family friendly! We loved our stay! We had a great week in this beautiful condo. The view of the beach is absolutely gorgeous as you can see way up the beach in either direction. We really are more balcony beach lovers and this was just right for us. The bed was comfortable and that was a big thing for us also. Very clean. Washer and dryer we used almost every day. We bought I cream and the freezer didn’t keep it frozen (about like a milkshake) but ice maker works great and it keeps other things frozen good. We did go to down on the beach one day and the chairs, umbrella, dip net and boogie board are all in the condo, (we had none) another plus. The owner was great to work with. He is very nice and helpful. Overall~AWESOME!! We had a wonderful stay. Juan was a great owner and treated us like guests in his home, which we were. We were most impressed by the cleanliness of the condo. We hope to be able to rent this unit next year. Thank you for your review! We are looking forward to host you next year, book early so you don't miss on your preferred week...The hand bag will be mailed this week. Awesome condo with AMAZING views! This condo was perfect for our stay! Great floor plan, beautiful views, easy access to the beach, secure building, and very clean! The condo had everything we needed, including beach chairs and umbrella. It is super close to the grocery store, pharmacy, awesome restaurants (go to Aunt Catfish!!! ), and beach stores. I highly recommend staying at this condo!!! We plan on coming back again and again! This condo is very nice. The mattresses in both rooms are very comfortable .We would highly recommend this rental . Has an Awesome oceanfront view. Close to gro. store , shopping. Great seafood restaurants close by. We recommend Our Deck Down Under and Racing's North Turn. Owner's were very attentive , returned calls and email right away. Your review is greatly appreciated and we are happy you enjoyed your vacation. We are sorry we did not meet personally but hope to do so next time. The condo was clean and comfortable with a nice floor plan. The balcony was very spacious and the view is second to none. It has underground parking that is very secure and convenient. Our family of five very much enjoyed our time there! Thank you for the nice review, come back soon!